Uptime for Bluehost has been decent over the past six months, averaging at 99.97% with a few fails in the past 90 days. Customer support is available 24 hours a day/ 7 days a week through Bluehost, and you can contact them through live chat. My experience with Bluehost customer service has always been positive. I can get to speak to a representative via Live Chat in less than 2 minutes. HostGator offers some good hosting options for those looking to buy a dedicated server package. This provider offers a fewa features including customization of SSD storage, RAM, and data transfers. HostGator provides unlimited data transfers, which is better than most of the dedicated server hosting providers. You can find Linux and Windows dedicated hosting. This is important if you want to customize your server with different applications in a certain language. You can install all kinds of applications into your dedicated server including WordPress or other CMS platforms, as you will have plenty of space on your own server. Uptime has been reliable for HostGator, remaining at 99.99%, and customer service reviews show HostGator is reliable and offers extensive customer support options. HostGator provides a decent price for a good dedicated server with lots of features including custom setup from their customer service team. Security options may be extra. The lowest rate must also be purchased upfront instead of month-to-month pricing. If you are looking just for the basics, you can start with their dedicated hosting plan at $199. This is a single processor server that you will have to set up on your own without all the bells and whistles. Uptime on Liquid Web is pretty standard at 99.98% with a few failures in the last six months that brought down their rating. Customer support is friendly and available 24 hours a day, 7 days a week. Liquid Web has a number of different SMB and enterprise-level plans for whatever you want to do with your storage. The price difference between Liquid Web can grow as you add more storage and features. You can start out with a smaller server and grow your hosting packages through Liquid Web’s customization options. Want to configure your server with 3TB of storage? 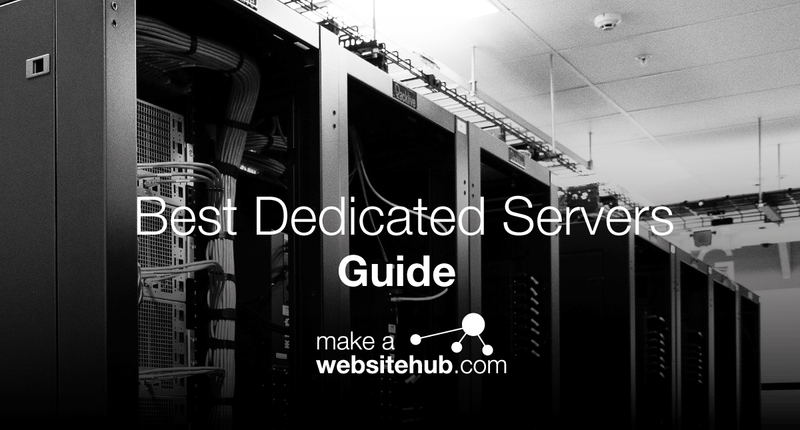 Then InMotion has a good dedicated server for you. InMotion only offers Linux-based dedicated web servers. The servers come with 64GB of RAM, which is very impressive as the industry standard is 16GB. However, one drawback would be the limitation on data transfers. Most hosting providers offer unlimited data transfers, but InMotion will set your limit to 15TB of monthly data. This is typically not an issue and may as well be unlimited. InMotion does not have issues with uptime and remained 99.99% on average over the past six months. Their customer support is a little lacking, and you will not find technical support available 24 hours a day, 7 days a week. 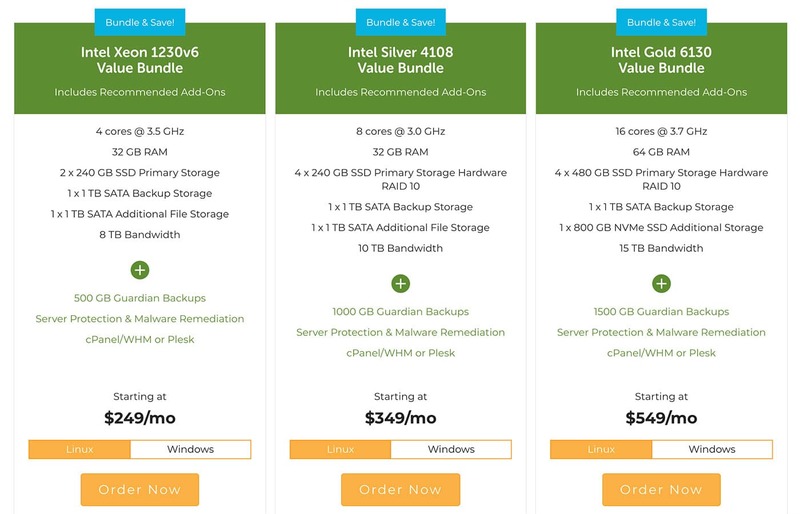 InMotion offers a good price for a dedicated server that provides all the space and RAM to build any Cloud engine you want. However, there are a lack of customization options and free features that are included with other servers. You will have to pay extra to have your server set up through InMotion. There are lots of built-in security features to love about DreamHost. This provider really cares about its customers’ websites and offers firewall protection, as well as SSL certificates. Their dedicated hosting options start at $169/month and come with 1TB of storage. You can configure the servers with up to 16G of RAM as well. DreamHost does not have Windows-based servers, which is a drawback. With Linux-based servers, you can build most applications with a variety of different languages. If you wanted to build a website using Microsoft’s operating system, you would not be able to. Uptime has been relatively good for DreamHost in the past six months with an average of 99.96%, and their customer support is questionable. They do have an extensive knowledgebase, but it may difficult to get in touch when you have issues. 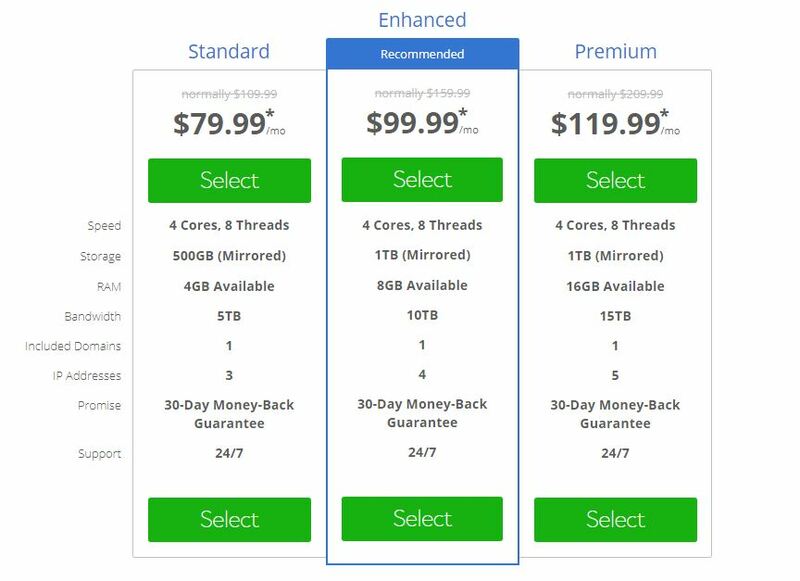 DreamHost provides a decent amount of storage for the price, but without Windows-based servers and customer support issues, you will be better off getting with a company that offers excellent customer service for the price. GoDaddy is the King of discounted web hosting. Their dedicated hosting comes with a rock-solid uptime, so you never have to worry about your website going down. They have also recently added 24/7 technical support with live chat so that you can get problems resolved quickly. If you want to start a business with a dedicated server, GoDaddy is one of the better options. This is because you can build in Linux or Windows, and plans start at a pretty low rate but offer 32GB of RAM, 2TB of storage, and unlimited monthly data transfers. GoDaddy is a good startup website host if you want a dedicated server. The cost is cheaper than others and offers a larger amount of storage for the base plan than other competitors. Hostwinds is a dedicated reseller and has received a ton of good reviews for being a cheap option with a lot of storage. Their dedicated hosting plans offer affordability with enterprise-level power and support. You can customize or prefab a Linux or Windows-based dedicated server. Both of these start at $100/month. You can create a configurable server with up to 3TB storage per drive bay with a maximum of four drivers using Hostwinds. These servers also come with 128GB of RAM and unlimited monthly data transfers. If you were able to max out all that you could do with these servers, you may spend over $1,000/month though. Customer support has been highly reviewed with Hostwinds, and they offer multiple ways to get in touch whether you need technical support by phone or live chat. Uptime is also incredible at an average of 99.99% over the past six months. If you want a dedicated server with a lot of options and storage, this is the best choice as far as power and uptime. The price for a dedicated server hosting through 1and1.com is unheard of. Most dedicated hosting costs start at $100 or more. 1&1 provides three different Linux and Windows dedicated hosting tiers. These are dedicated hosting servers, which is different than purchasing your own dedicated service. The entry-level dedicated servers start at $69.99 with 8 GB of Ram, 1000GB of storage, and unlimited data transfers. If you are managing a small website with very little traffic, this should meet your needs. You can also check out the Performance package if you are looking for something with more storage. These plans start at $199/month. Uptime is not always reliable through 1and1.com. We found their uptime dipped to 99.01% in the past six months. You may have more congestion by purchasing some of their smaller “dedicated servers,” but you should check that you are purchasing your own server and not sharing any space with other customers. You pay more for very little with 1and1.com. While they do offer some enticing “dedicated hosting tiers,” these tiers may not come with your own server, leading to congestion and possible slowdown of your website’s load time. SiteGround has not had the best reviews as of lately, but we wanted to provide a variety of options and places to look so you can see what features are available. SiteGround plans are for smaller businesses and provide some built-in features to get setup quickly. However, the cost and value do not match. SiteGrounds charges a lot for a dedicated server but does not have the storage as other hosts do. They do have a great uptime testing at 99.99% but so do many other hosting providers that sell dedicated hosting. SiteGrounds is rather expensive for what you get. While security features are included in the price, the entry level point is rather high for a small business. Arvixe’s dedicated servers start at $131/month but only for the traditional hard drive-based servers. Arvixe also provides options for dedicated cloud servers that start at $108/month. You can configure your server in Linux or Windows, and each plan has a number of storage options. At base, Arvixe’s dedicated servers come with 8GB of RAM, 300 GB of storage, and unlimited monthly data transfers. This base storage is not a whole lot to work with if you want to build a larger e-commerce website, but it may be okay for a smaller company. These offers are okay, but the uptime is what makes it a little better. At 99.99% over the past six months, Arvixe stays on par with the other top web hosting companies. However, the storage options and lack of customer service support options on their website make it a bummer if you want to customize or fix any issues with your server. Arvixe is a good option for smaller websites, but the price and value are not matched to what other competitors are offering for a lower price. Media Temple only offers enterprise-level dedicated server hosting. This means that you are a Linux master and can set up your server yourself. However, you get all of the storage you could ever want including 10TB monthly bandwidth, 128 GB buffered DDR3 RAM, dual-socket, multi-core Intel Xeon processors, and 1TB all SSD storage. Media Template also has managed dedicated servers that come with an easy-to-use control panel and dashboard, as well as performance monitoring tools, daily backups, OS, application updates, security and malware scanning, and automated malware removal. If you want to spend the big dollars on a dedicated server that will last forever, you can purchase one of the masterful units from Media Temple. This is not for small businesses but for enterprises or game servers that need to support a ton of traffic. If you want a budget dedicated host with a few more options thrown in, SingleHop has a great dedicated entry-level plan that includes 8GB of RAM, 10TB Bandwith, and 2 240GB SD drives. Wanting more in your server plan? They also provide single processor, single thread, and custom enterprise options that range up to $349/month. Uptime for SingleHop is extremely performance-driven at 99.99%, and they have a great support staff with lots of options. The great thing about SingleHop is that they provide custom on-demand server deployment. They guarantee that servers will be online, secured, and ready for use within 60 minutes. They have also developed an award-winning infrastructure called LEAP that lets you add and remove applications or customization options with a lcick of a button. SingleHop’s servers offer a number of customization options for storage at a relatively decent price, but you can find some more storage at the enterprise hosting providers rather than through a smaller company like SingleHop. Rackspace dedicated servers feature custom security options, architecture design, migration assistance, cloud environments, and response time guarantees. You can choose SSD storage from 480GB to 800GB, and you can get up to 3TB of RAM. In our experience, Rackspace offers a truly superior server for a bigger website or gaming server if you need. You will get tons of storage options and guaranteed uptime. Their customer support is always available and located in the US, so you can always talk to someone about any issues and get them fixed typically within a couple of hours.